DomainKeys Identified Mail (DKIM) help email providers to authenticate and verify the sender to prevent spoofing, phishing and email spam with the help of DKIM-Key signature attached with the email header fields. G Suite gmail user has reported that they are getting “We are unable to process your request at this time. Please try again later. (Error #1000)” message while generating DKIM record. Well, in this article we will investigate bug and find the solution to DKIM generation error. Log in into the G Suite Admin console in Google Chrome and open the Authenticate email page from the left sidebar Apps>G Suite>Gmail. Right click on the page and select the Inspect option from the menu. Once you have opened the network tab, click on the Authenticate email section followed by Generate new record link and try generating the DKIM. On failure you will notice that the Chrome has logged Error 500 while loading some resources which is used to generate the key. Error 500 usually occur because of the Internal Server error which could intended as well as technical glitch. 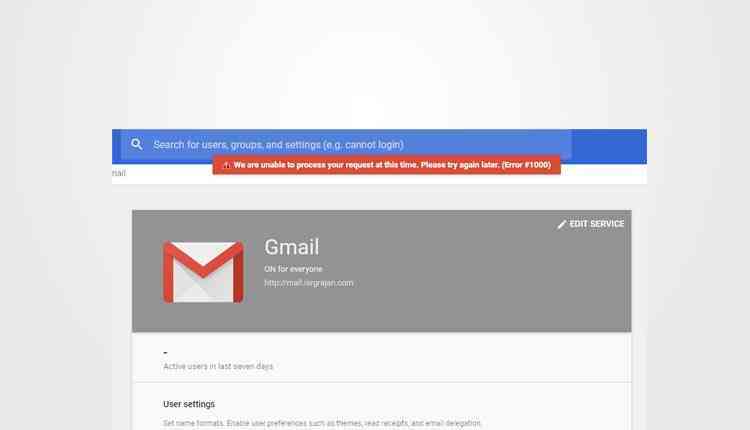 In case of G Suite it is an intended error deployed by the Google Engineers to restrict the newly signed up users to Generate the DKIM for unknown reasons. “We are unable to process your request at this time. Please try again later. (Error #1000)” automatically get resolved after 48 hours of your sign up. So, the only solution to this error is to attempt to generate the DKIM after 2-3 days of your sign up.